Eron Ranasinghe alias SF Loku, the main suspect of the killing of Night Club Owner and Karate Champion Wasantha Soyza of Anuradhapura, was arrested by the police today in Chilaw. The suspect an army deserter who was once attached to the Special Forces and his brother Asitha Ranasinghe had been arrested in Tangalle on Saturday (31). Earlier Anuradhapura Chief Magistrate has ordered to prevent Eron Ranasinghe alias SF Loku, from leaving the country. The police have thus far arrested 27 suspects in connection with the murder. 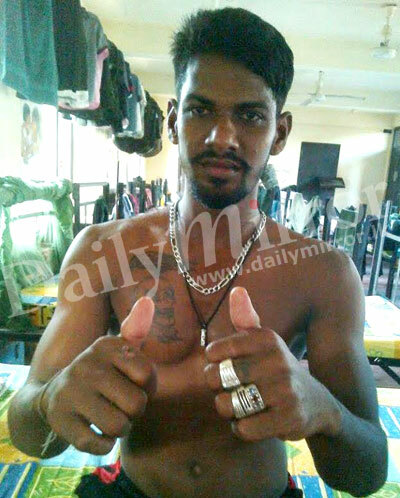 Alexander Wasantha Wickrama de Zoysa, an ex-Karate champion who is said to be the owner of more than ten Guinness World Records, was hacked to death by a gang during a brutal attack on his night club on October 25. Several individuals including the manager of the nightclub were injured following the attack, which also resulted in large scale damages to the property. I WISH , WE WOULD NOT HEAR THAT HE WAS RELEASED ON BAIL. Are all these products from a disciplined armed forces that fought with the UN charter in one hand? Why project the son of a ruthless murderer, Alfred Soyza of Kalattawa who was hanged for the murder of his driver when he asked for his back wages to go and see his wife and sibblings. These criminals should not be seen roaming in the street again. Criminals once caught should not be let out. There has to be strict regulations otherwise we can never curb violence and murders.